Teriyaki Chicken Wings, Barbecued chicken wings, or fried chicken wings with hot sauce are as crucial on Super Bowl Sunday as the two opposing teams and their footballs. We want to tell you a secret. We hope you won’t upset with us, but we don’t care about the game. It’s almost sacrilegious, we know. We just think there are some things more important on Super Bowl Sunday to cheer. You can make the sauce for the teriyaki chicken wings several days in advance. As you cook, slather the sauce on the wings. Don’t forget to paint the wings with more sauce when they are done. 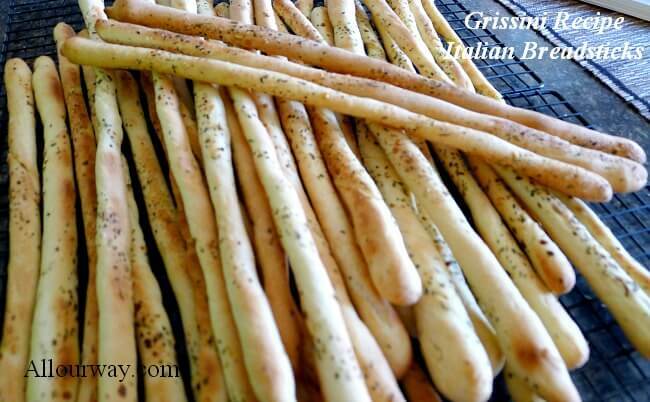 How about some Grissini (breadsticks)? Grill or bake the teriyaki chicken wings early in the day, then warm them in the oven just before serving. This method works well if you decide to make Spicy Barbecued Chicken Wings along with the teriyaki wings. 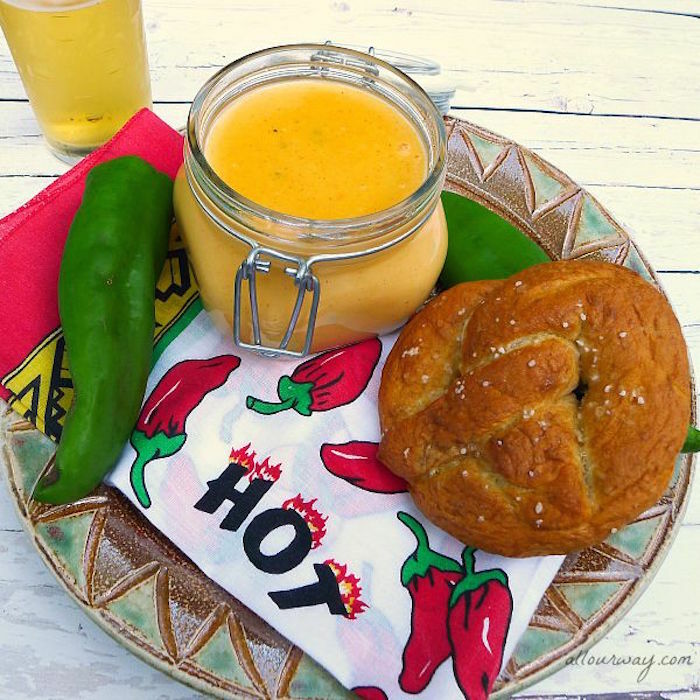 Make Soft Pretzels with Spicy Cheese Sauce and freeze the pretzels. On Super Sunday, thaw the soft pretzels out and stick them in the oven for a short time before serving. The cheese sauce is great a room temperature. 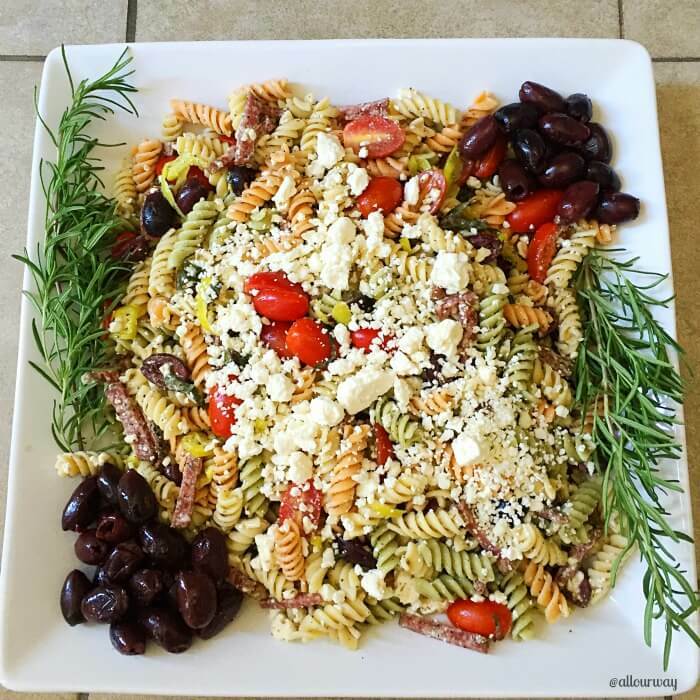 Our oldest son made a fantastic Mediterranean Herb Antipasto Salad Platter. He couldn’t figure out why we were making such a fuss over it when he bought all of the ingredients, arranged them, and then poured a salad dressing over it. We tried telling him it’s the presentation! Sometimes the easier it is, the better it tastes! 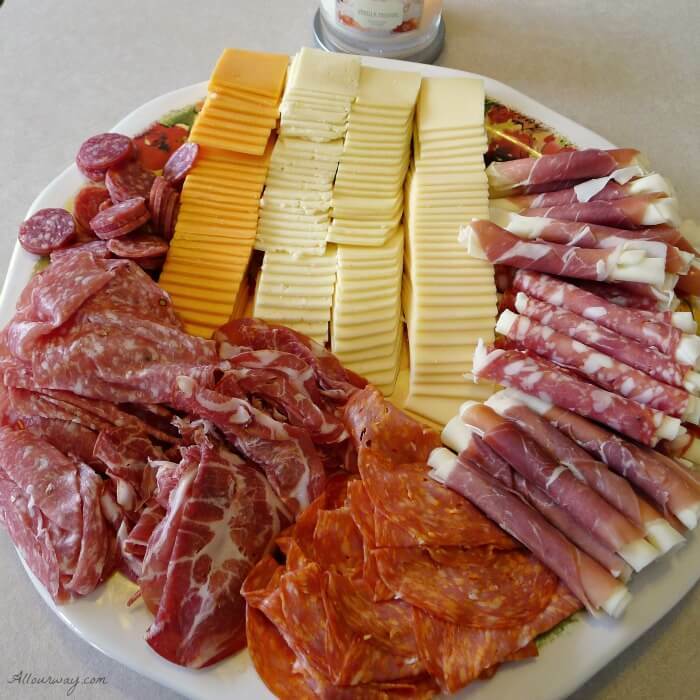 Make a meat, cheese, and olives board. You can assemble it early in the day. This type appetizer you don’t need to heat or refrigerate during the game. Be sure to sign up for our newsletter so we can keep in touch. We love sharing our adventures in and out of the kitchen. Chicken wings with a spicy Asian flavor. The sauce is spicy, sweet, salty and irresistible. This Teriyaki chicken wings are so good that you won't be able to stop at just one. Heat the grill to medium high. Drain the thighs or wings and season them with sea salt and pepper. Grill the thighs or wings until golden, 15 to 25 minutes, turning as needed. DON'T turn too much. When the thighs or wings reach a golden color, around 155 F, baste them with the sauce, turning as needed until the wings are glossy, well coated and reach 165 F. ** Baking instructions in Notes. 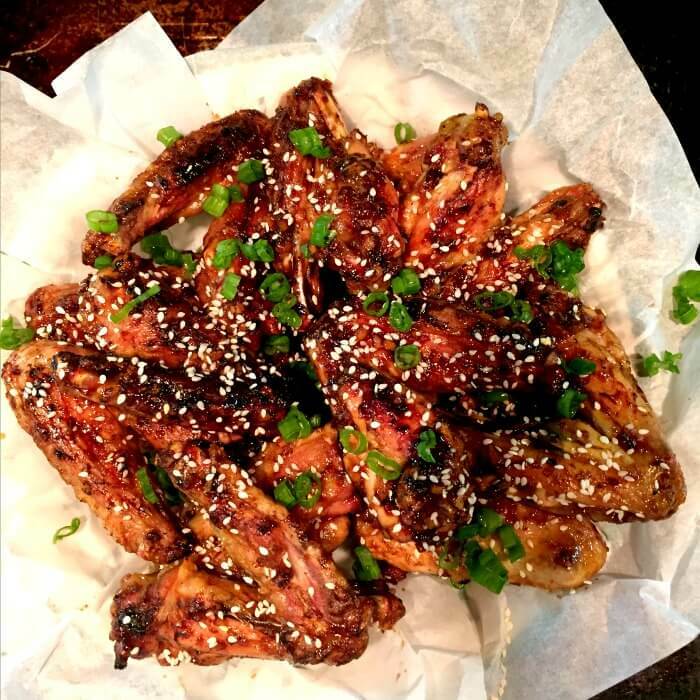 Remove to a serving platter and garnish the wings with the sesame seeds and green onions. Serve with the reserved dipping sauce. If you want to lick your fingers you have our permission-- it is acceptable and highly recommeneded. Preheat oven to 400 F. set a wire rack inside each of 2 large rimmed baking sheets lined with foil. Drain the wings and season them with sea salt and pepper. Divide the wings between the prepared racks and spread out in a single layer. Bake the wings until cooked though and skin is crispy, 45 -50 minutes. Baste on both sides with the sauce. Bake for another 8-10 minutes. Follow the rest of the direction as in the grilled wings. Note: Recipes and content from © 2017 All Our Way are copyright protected. 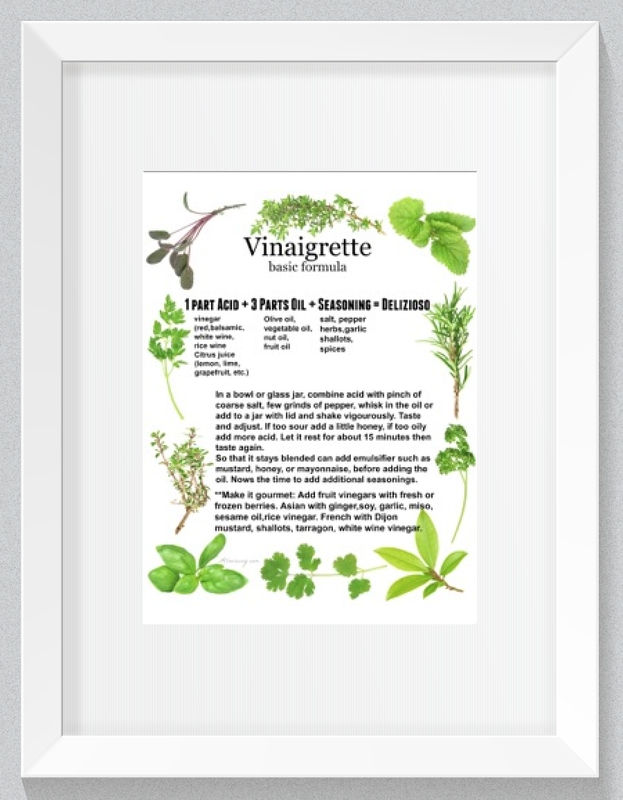 Please do not use content or recipe without prior permission. If you want to share the information, please link to this post. Grazie. These look sooo yummy! All the best flavors (teriyaki, spice) in the best packing ever (I mean who can get enough of wings??). Definitely trying them! Teriyaki is my favorite wing flavor! I love the spice you added so it is not just a sweet sauce. Yum! Love the idea for spicy teriyaki wings. So yummy! Wings are one of my favorite things to cook. I am there just for the food too HA! I don’t mind the game on in the background but with food like these tasty looking wings who would be watching the game anyways?! My oldest son loves chicken wings, the more heat the better for him For me I’d be very content with those yummy looking breadsticks. These look absolutely finger licking delicious! We are huge wing fans and my kiddos love teriyaki. We’ll be making this soon for sure. Teriyaki does very well in my household! My family would really enjoy these wings, they look amazing! Finger licking good is perfect when it comes to Teriyaki. My kids love Japanese food but my Rhea is the one who never stops licking her fingers – This sounds so delicious. Love chicken wings made with sticky sauces. 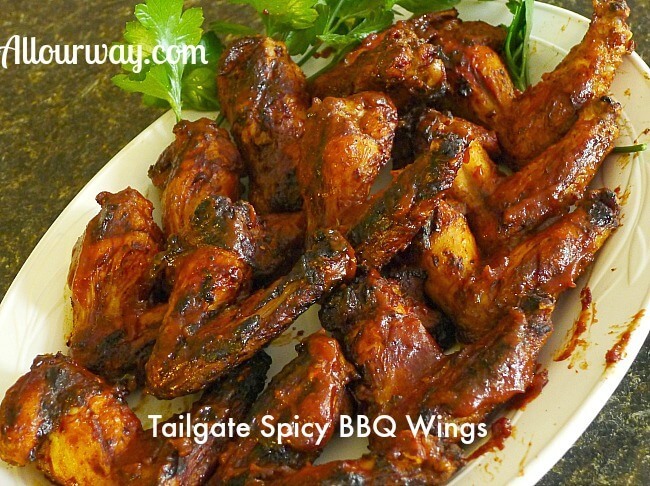 What a delicious recipe for spicy teriyaki chicken wings! I agree – they look finger-licking good. I can hardly wait to make this recipe on Sunday. I love teriyaki anything, but especially on chicken wings. I also like that these are baked, not fried. perfect for Sunday football games! Marissa I’m a fan of your blog and your teriyaki wings, omg droolings!! I can’t wait for game day to make these wings, but like you said, we care more about food, not the game right? Thank you for being a fan, Amy! I truly appreciate it. And I do think a lot of people enjoy the food more than the sport. but that’s okay – we still have fun. you all sure know how to make a simple dish turn into a banquet. I dont know which I love more that antipasto try or the salad with wings. I will take alot of all please! The wings look great and I don’t care who sees me lick my fingers! You had me at spicy! Oh my my….apt name those chicken wings look finger looking good. I really would like to be invited to your party! Every dish looks soooo goood! I held a super bowl party – but, the tv actually stayed off. Lol. We ate all the food and played silly games with our neighbors in our back yard (I’m in AZ – it’s not snowing). Wish I’d seen these chicken wings before planning my menu – they look amazing! Love the idea of grilled wings! I don’t deep fry at home, but we love to grill – such a great idea! Bundle up in a winter coat and hat and grill those wings! Hello, Julie! Grilled wings are great! We don’t deep fry a lot — only for special occasions and we fry outside. We don’t like the odor of “fry” inside. Let’s hear it for warmer weather and grilling!! These wings sound so tasty! I love all of your other ideas for the party for the Super bowl, or any party, haha! I only watch for the commercials! I’m not a football fan and I don’t live in the US anyway – but man do I wish I was/did now that I’ve seen all the super bowl food on blog and social media ? Hi, Giselle! If you make it to the States let us know and we can have a Super Bowl Party — food only. Your teiyaki chicken wings looks delicious, I have made teriyaki tofu, I bet these chicken wings are amazing. I am writing this comments in between the super bowl game.You can invite me any time for the party. I love teriyaki flavored wings and didn’t know how easy it was to make wings until I made them at home recently. I am looking forward to the game, food, commercials and the half time show! I’m looking forward to enjoying a plate of wings during the game! I hope the team you’re rooting for wins, Megan. But regardless — we can all enjoy delicious food, right? I’m definitely coming to your house for the Super Bowl party!! 🙂 These look delicious – Pinned to my Game Day board for next football season!! Ciao, Kathryn! Thank you for pinning. Hope you’re team wins the Super Bowl We’re for anyone who isn’t called Patriots 😉 You know, Indiana — Colts?? Have a great Sunday!! Homemade chicken wings are so good. Love that these can be baked or grilled. I will be happy when grilling weather returns to our neck of the woods. Until then…baked in the oven they will be. I guess you can say we cheated. We aren’t home but we are in grilling weather. We escape the cold as much as we can — our old bones can’t stand the cold. We just love to grill and take every opportunity to do so. Wow! You have gathered some delicious recipes here fit for a king! Love all the sesame seeds sprinkled all over your chicken wings as they sure add extra flavor and crunch to this yummy dish! Marisa, I would really love to be invited to your party. Everything looks sooo delicious, and these teriyaki chicken OMG it looks AMAZING! I’m a bit obsessed with chicken wings lately, and I’m always looking for new recipes to try. Pinning this! Thanks for sharing! Hi, Natalie! I know how you feel about wings, you can’t eat just one. 😉 Let me know how you like the wings. These look like they’re finger lickin’ alright!! What time does the party start? I’ll be sure to be there with bells and whistles on and first in line for these wings!!! I’ll also take a to go box of 50!!! Don’t you just love Grissini? My kids could eat their weight in those delicious sticks and you know they don’t weigh very much. Did you dip them in anything? 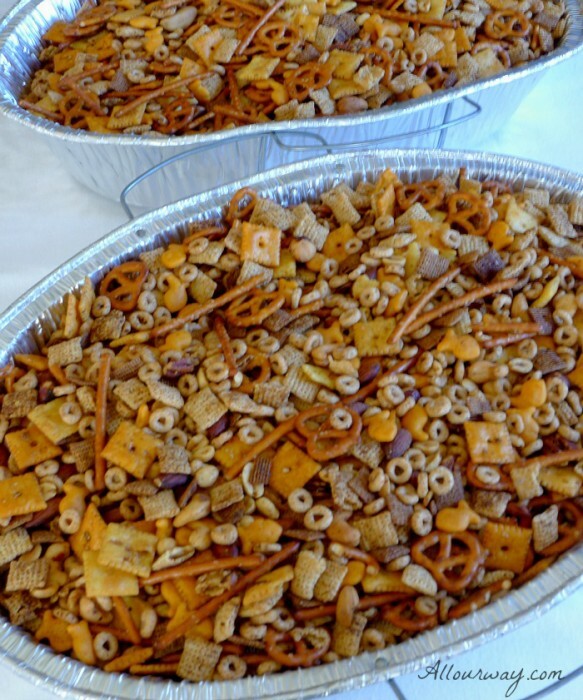 Love that spicy party mix! You’ll be welcomed with open arms!! I’ll even give you some munchies “to go” and share with the family. Have a great weekend. Hugs! I’m with you! I don’t care anything about football and don’t give a hoot about the game but the food, now that is another thing entirely. I’m definitely making your Spicy Teriyaki Chicken Wings on Sunday. they look delicious! Well, wing master, I think you’ll have a new favorite wing flavor. The teriyaki is really good and if you like it spicy, this is for you! I have to agree that Super Bowl Sunday is more about the food and hanging out. I mean I guess sometimes I can get into a good game if it’s close. But seriously you need good wings and these sound amazing! Hi, Stephanie! Thank you. I think wings were made for Super Bowl! There is football on Superbowl Sunday?! I thought it was all about food and commercials! 😉 Actually, I am the only non sports enthusiast in my household, but while they are watching the game, I am happily nibbling. These chicken wings do look finger-licking good! I also appreciate your list of other tasty ideas! I was surprised too, Wendy, when someone mentioned that there was a game going on. I have too much fun enjoying the food and talking to actually pay attention to a bunch of guys chasing a ball. OMG that spread! I’m coming over to your house for the Super Bowl, mk? Definitely agree though, for any party I host that involves food (which let’s be real is all of them), prepping anything I can beforehand is a life saver! The food is my fav part too! Although I am really looking forward to Lady Gaga’s halftime show (fangirl!). And, of course, the commercials! I am coming to your super Bowl party. Lots of scrumptious foods. You’re invited! Not guaranteeing we’ll watch the game but we’ll have lots of food and I’m sure great conversation!! Indeed I bet you are! Have a happy weekend. Hi, Maria!! It sure sounds like fun but we are already committed. Got your card — it was our pleasure 🙂 Have a great weekend.